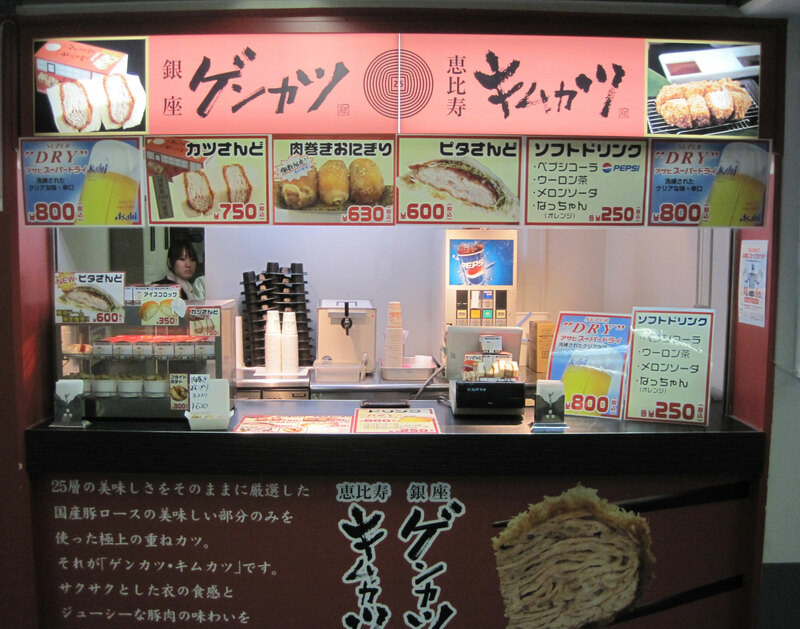 I touched on the Tokyo Dome’s food options a few days ago, but concession stands here deserve more than just a couple paragraphs. If your local MLB park serves bento boxes and fried squid, feel free to go watch the French baseball fans again or something. 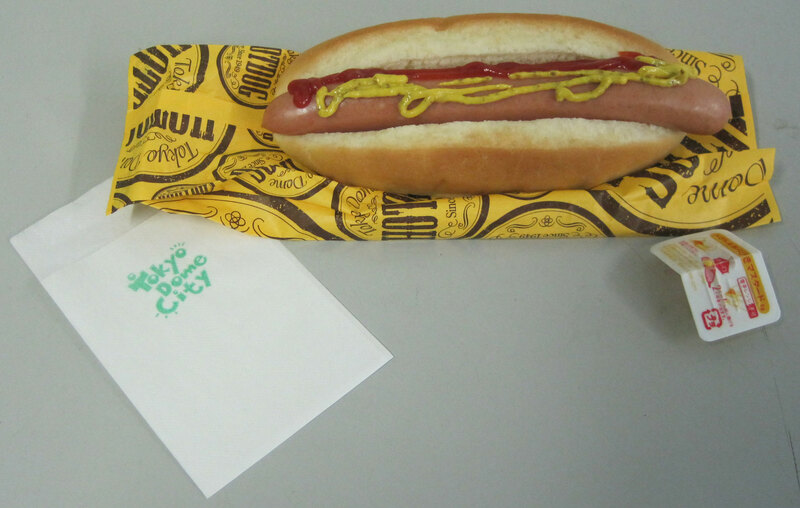 Even 5,000 miles from Chavez Ravine, you can still enjoy a hot dog at the ballpark. Regular dogs come on a bun with a combo ketchup-mustard pacakge, and there’s also a jumbo option skewered on a wooden stick. The standard dog tasted like your average dirty water wiener, although somehow made with lower quality meat. Definitely a hint of Spam in there. They also don’t serve sauerkraut, which means I could never live here. I’m not proud of occasionally eating kraut and mustard on a bun with no hot dog, but that doesn’t mean I don’t enjoy it. French fries and popcorn are also popular, and there’s a combination hot pretzel/churro stand (chetzel stand) on the upper concourse. 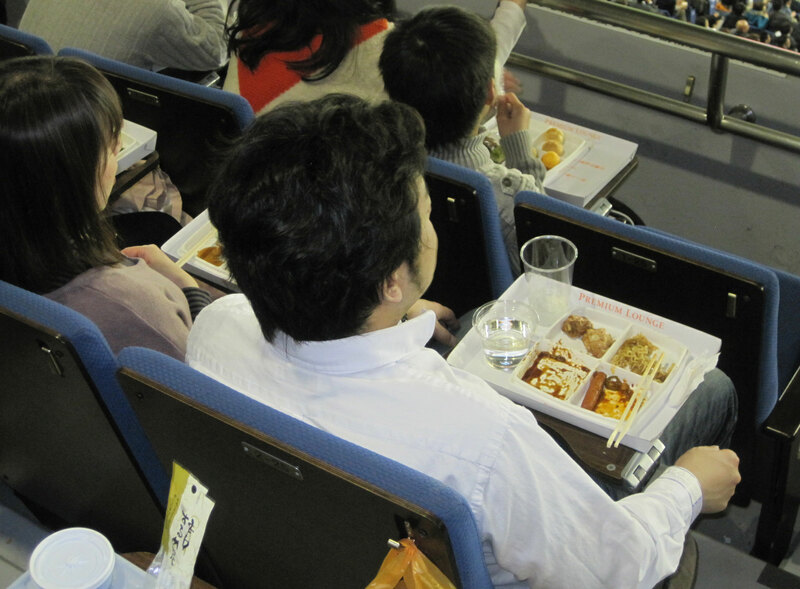 Bento boxes are a common site and come in several sizes featuring rice, Japanese veggies, sushi roll pieces and various items tempura. I didn’t try any of these delicacies, but a scout for one American League club reported the veggies were fringe-average and the fried stuff was no better than a 40 on the 20-80 scale. As the old saying goes, sometimes a picture is worth six Japanese characters. I wasn’t going anywhere near these popcorn somethings, but the sign indicates they’re either deep-fried squid or deep-fried octopus. The squidopus even seems to be saying so himself. In general, seafood is not something I’m willing to get real adventurous with. I’ve just been burned too many times before — the Great Shrimp Crepe Incident of 2011 comes to mind. But “When in Tokyo…” so I went out on a limb Monday, ordering the chef’s choice of nigiri at a moderately upscale sushi joint near our hotel. Some of it was slimy. Some of it was scaly. The chef may have found Nemo in the day-old bucket and sliced him up for me. But I decided I was going to eat everything on the plate, and I did. 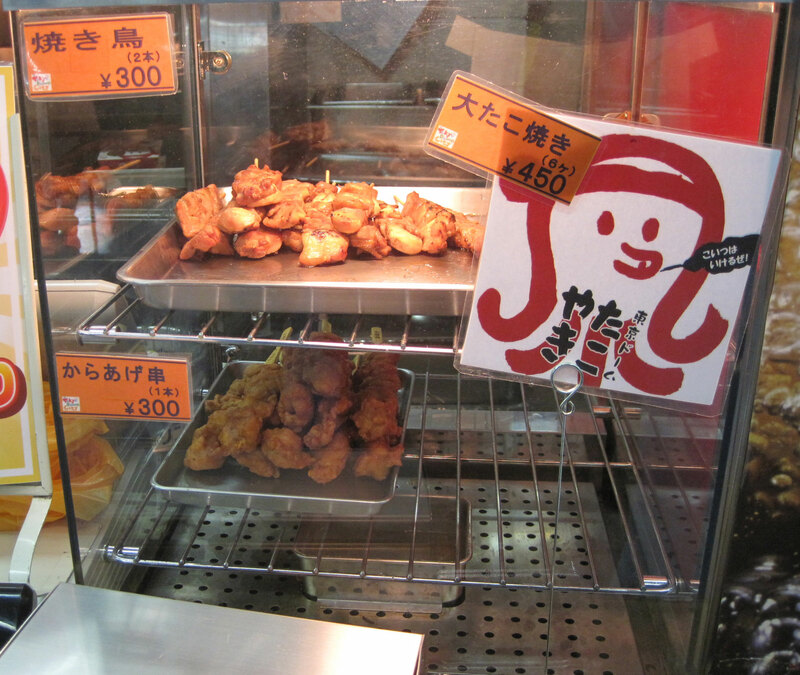 That said, I would never touch squid-on-a-stick at the Tokyo Dome. 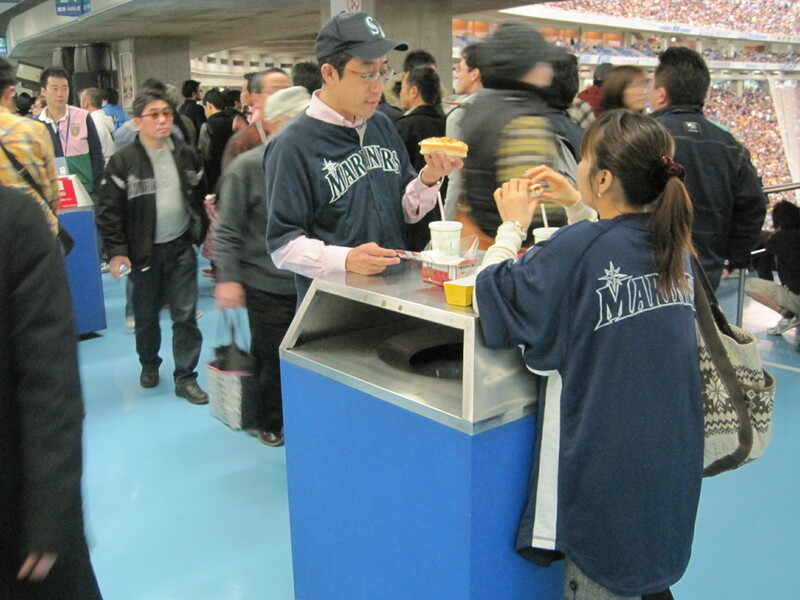 There are a few of these stands around the main concourse, but I cannot for the life of me figure out what the pictured food items actually are. I asked several of the concessionary engineers, but no luck. Is it a turkey sandwich? Cream cheese popper? Must be a high-class item with that ¥750 price tag (about $10). A hot dog costs half that. Noodle bowls and fries are only ¥400 ($5), although some of the curry rice and fried chicken bowls run as high as ¥860 ($11). 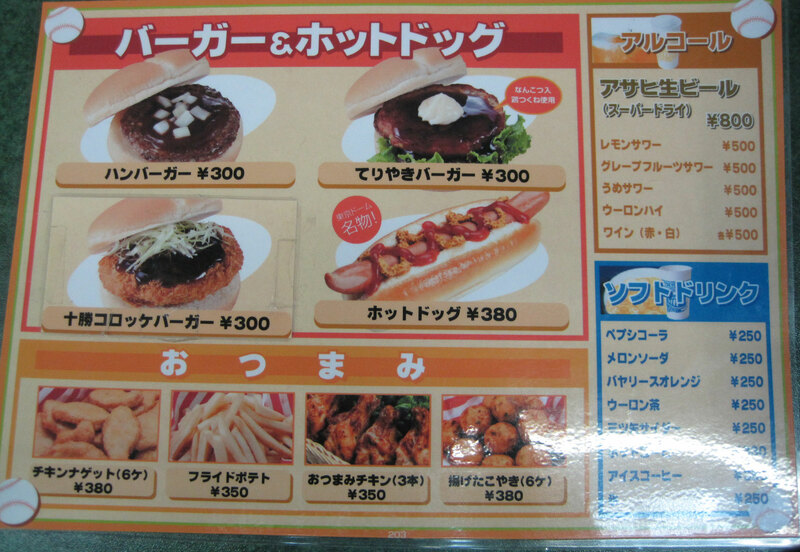 In a country where nothing is inexpensive, eating at the ballpark is probably 50 percent cheaper than at Citi Field. Then again, we’re half a world away from Shake Shack in more ways than one. When I discovered the premium buffet on the second level of the Egg, I was PUMPED. After eating two meals here nearly every day this week, I would have rather swallowed a samurai sword than taken down another gray noodle bowl. Priced at ¥2,500 ($33) and accessible only with a ticket in the luxury boxes or club seats, I was convinced this was finally stadium cuisine on par with that of newer American parks. Once again, disappointment. I don’t want to sound like Tom Colicchio during the first week of a Top Chef season. I love ballpark food, especially the stuff that’s unique to each Major League city. 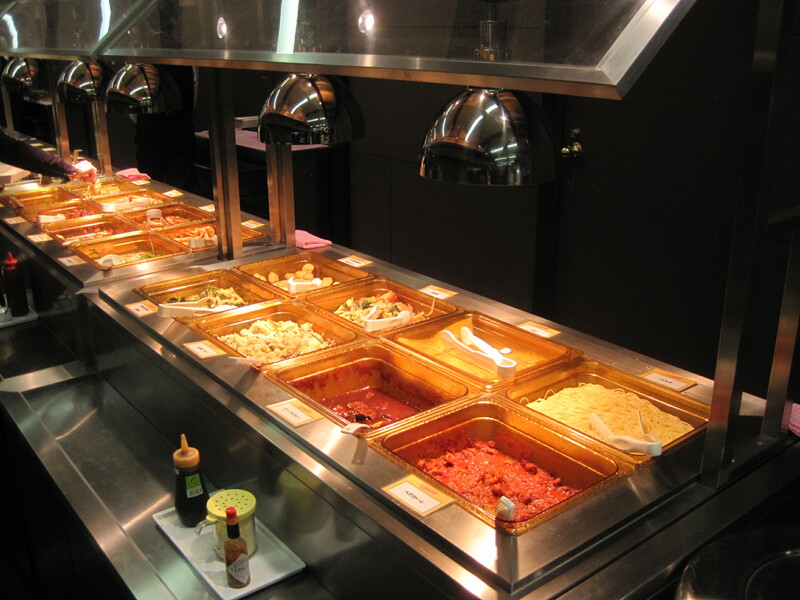 Every time I ordered this week, I was hoping for something that would warrant a “You won’t believe what they serve at baseball games in Tokyo!” But this buffet had Olive Garden-level spaghetti and meatballs along with dumplings and spring rolls straight out of a Panda Express styrofoam box. I flew to Tokyo expecting to visit one of the world’s finest cuisine hubs and haven’t been disappointed. From the $4 breakfast udon to the wood-fired margherita pizzas to the sashimi I ate directly out of a 10-food bluefin tuna, I’ve had some amazing food this week. But none of it has come from the Tokyo Dome. Great stuff here. Thank you so much for sharing. Looks like an amazing trip. Interesting they eat over trash cans…..